Proudly made in America! Each design is drawn individually by hand, glazed and then fired. Made of real terracotta Italian clay, these garden planters are in a class by themselves. Each piece is one of a kind with no two alike, and each refreshingly different and exclusive. Approximately 50% of their surface area is illustrated with distinguished designs and stunning colors. Use indoors or outdoors but don't expose to freezing temperatures. If you desire unique illustrations, and unsurpassed quality, then these are the garden containers for you.A perfect gift for that special gardener in your life. 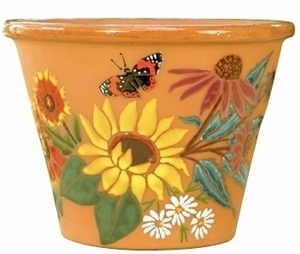 If you would prefer a flower local to your region place contact us for a custom pot.